The Frederick G. Gardiner Expressway, commonly just called the Gardiner, has been in the news a lot lately. This 18 km stretch of road between the city and the lake was completed in 1965 after years of planning and building. At the time that it was built, Toronto’s waterfront was largely industrial and there wasn’t much objection to having a 4 to 6 lane expressway, with many sections elevated, built there. The railway had begun the process of dividing the city from its waterfront a hundred years previously. As the city changes and grows, more and more people live in the downtown core. Industry has moved out and residents have moved in. 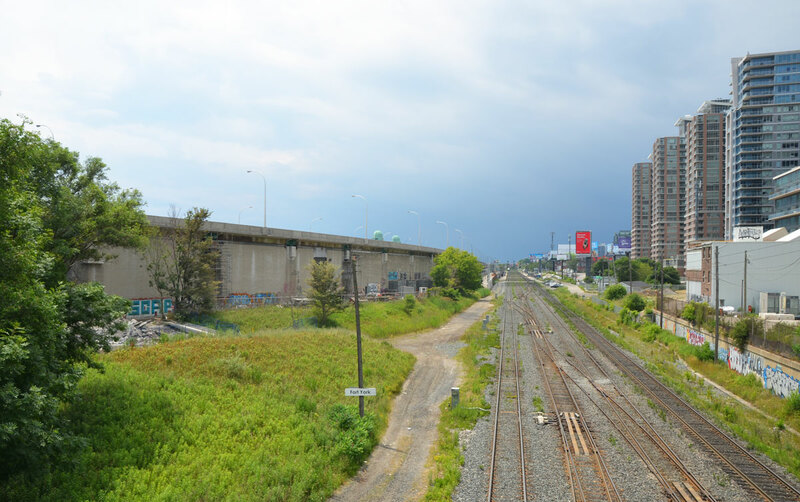 For so long the land south of the Gardiner as well as under the Gardiner was neglected, especially from a city planning point of view. But now, the city is looking differently at that swath of land. 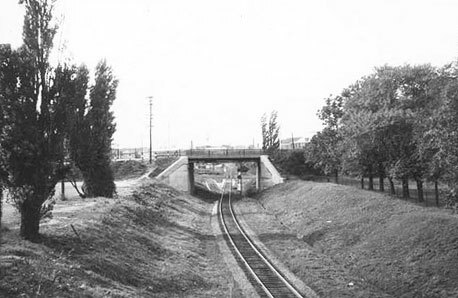 The far east elevated section between the Don Valley Parkway and Leslie Street was demolished in 2001 and there have been calls for the next section (Jarvis to the DVP) to be demolished as well. There has been some controversy as to whether to demolish it or move it… and if move it, where to? I am not even sure what the plans are at the moment. 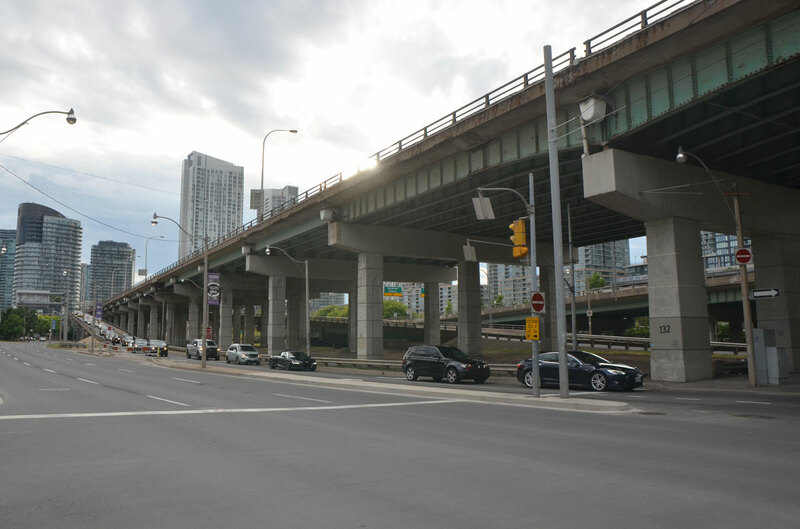 On the other hand, the western section of the elevated expressway (Strachan to Spadina) will remain standing. Work is underway to refurbish the structure – the city doesn’t want any more stories of pieces of concrete dropping onto cars beneath! 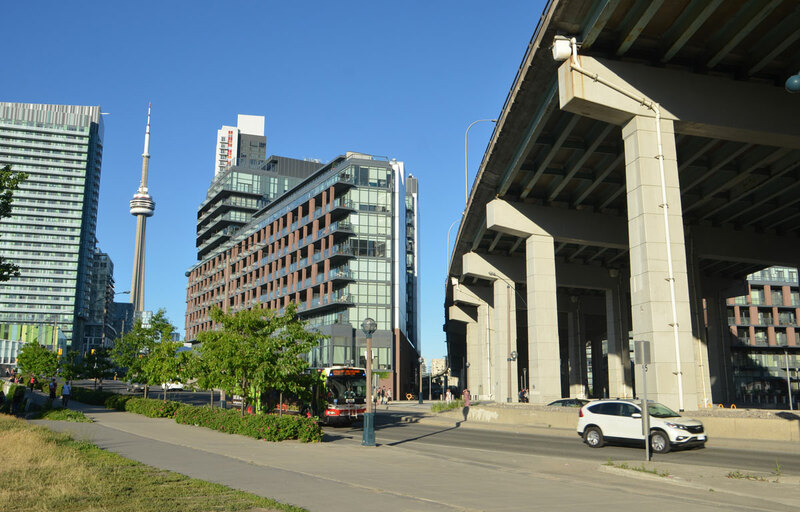 Plans are being implemented to use the land under the Gardiner much more efficiently. To make it work for the public. 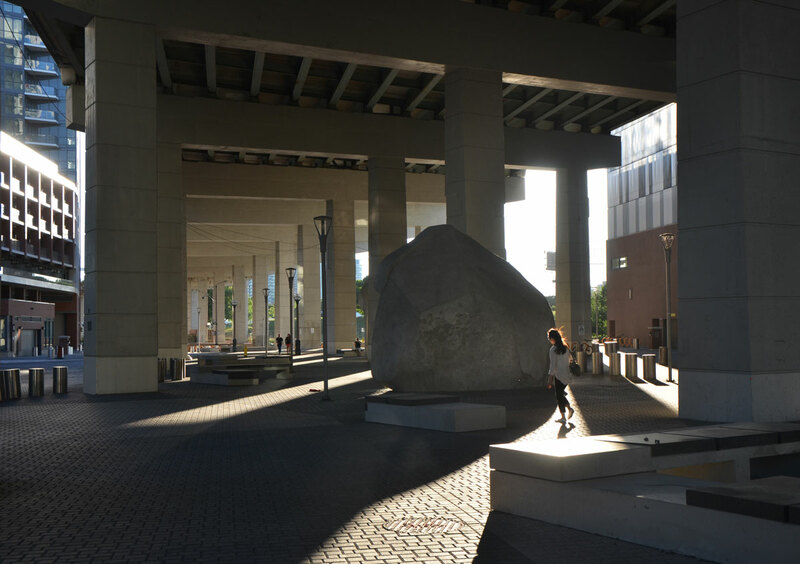 The Bentway is the name that has been given to this new park, or public space, beneath the Gardiner Expressway from Strachan 1.4 kilometres east to Spadina. The first phase is due to open Canada Day 2017 and it involves the stretch between Strachan and Bathurst. Many of you have probably driven on the Gardiner but do any of you know what is under it now? Let’s take a look. below: The Gardiner passes over Strachan Avenue which in turn passes over the railway tracks. below: On Strachan Ave looking west. Condo development in this area has extended right to the railway line. The Exhibition GO train station is in the distance. You can also see the Gardiner to the left of the tracks. Here the north side of the under part of the expressway is walled in and the enclosed space is used by Exhibition Place. 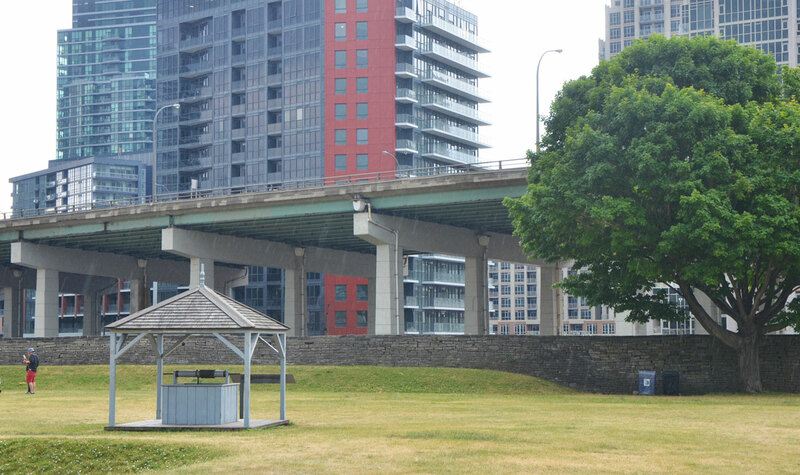 At this time there is no plan for the Bentway to extend this far; I have used this photo to provide more context as to the location of the park. 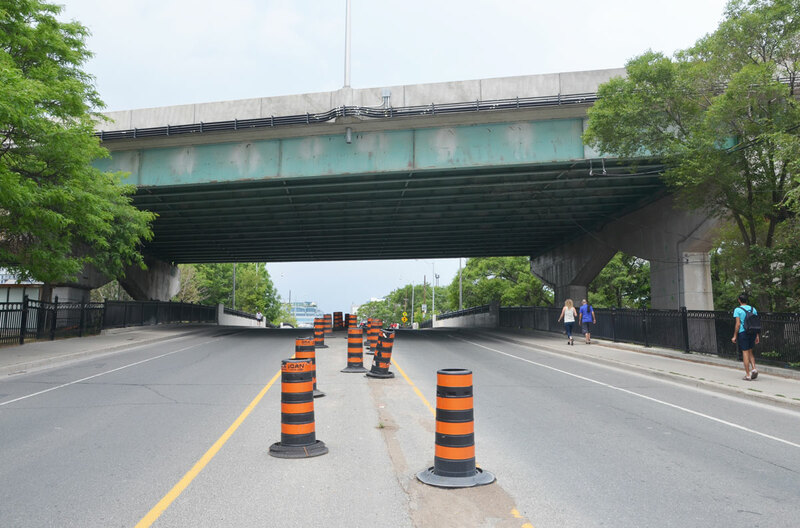 below: A closer look at the Gardiner on the west side of Strachan Avenue. Maybe there is potential to expand the park westward? to Exhibition GO station? And by the way, those concrete structures holding up the expressway – those are called ‘bents’ and that is why the park is called what it is. below: This photo was taken as I stood on Garrison Common and looking towards Strachan Avenue. This will be the western end of the new park. You can see the underside of the Gardiner as it passes over Strachan Ave which in turn is also a bridge. This bridge once crossed the Grand Trunk Railway tracks that were built in the 1850s. New entrances to the park are planned that incorporate the present sloped embankment of the bridge. below: A quick aside: It’s a slightly different angle, but here is a photo of the Strachan Avenue bridge from 1959, before the Gardiner was built. I suspect that there has been upgrades made to the bridge since then. Photo credit: R.L. Kennedy, found online (also a good source for the history of the Grand Trunk Railway in Toronto). Garrison Common is to the right. Garrison Common is the green space surrounding Fort York. It will abut (be continuous with?) the new Bentway. Fort York is a National Historic Site and on its 43 acre site are original buildings from the War of 1812 as well as an 1813 battle site. Did you know that the Americans beat us here in 1813 and controlled the city of York (as Toronto was known then) for a few days? below: The new Fort York Visitors Centre is now open. There is still being work done both inside and outside, but it is open to visitors. For so long the fort was hidden away and difficult to get to; it is nice to see it receiving more attention. 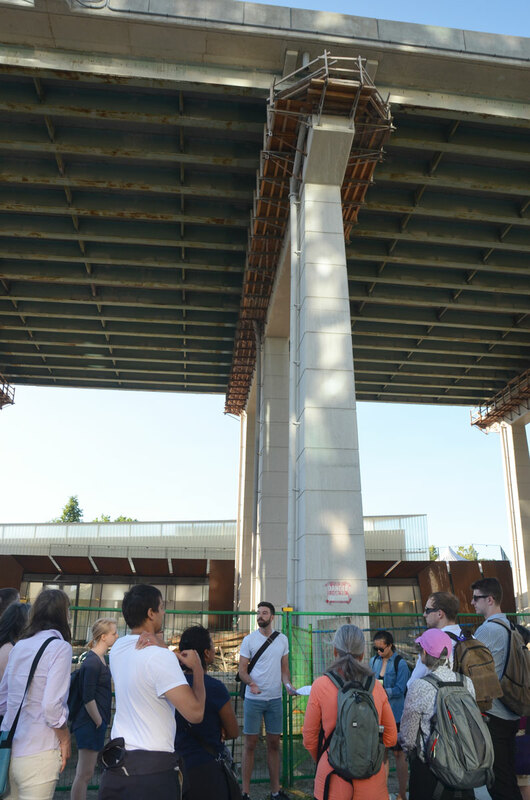 below: Jake from Park People, one of the groups helping to design the new park, stands under the Gardiner as he talks to a group of us on a tour. 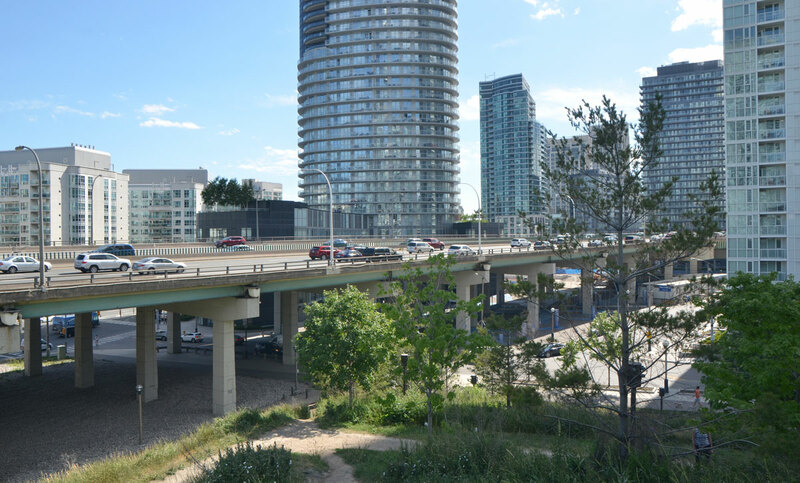 Here, by Fort York, the Gardiner is the equivalent of 5 storeys from ground level, the highest it reaches as it crosses the city. below: Standing on the grounds of Fort York. 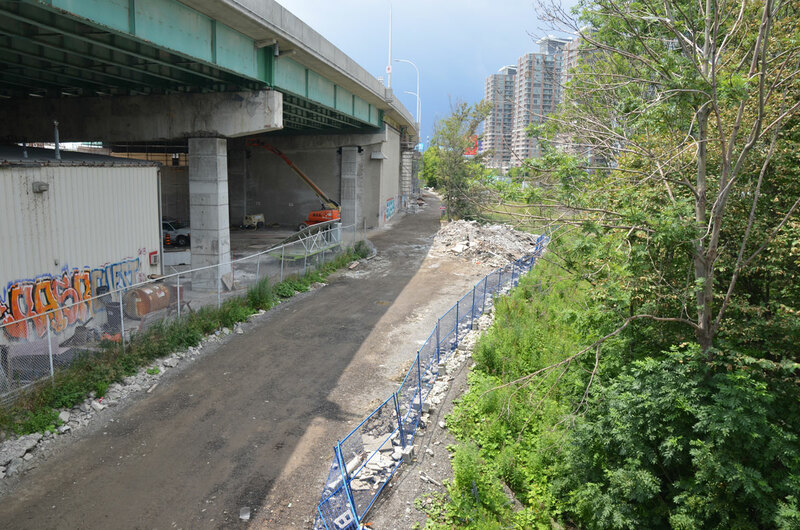 The Bentway will be beyond the stone wall. You can get a good idea of the spacing between the bents. These spaces are being referred to as ‘rooms’ and there are 55 of them between Strachan and Spadina. 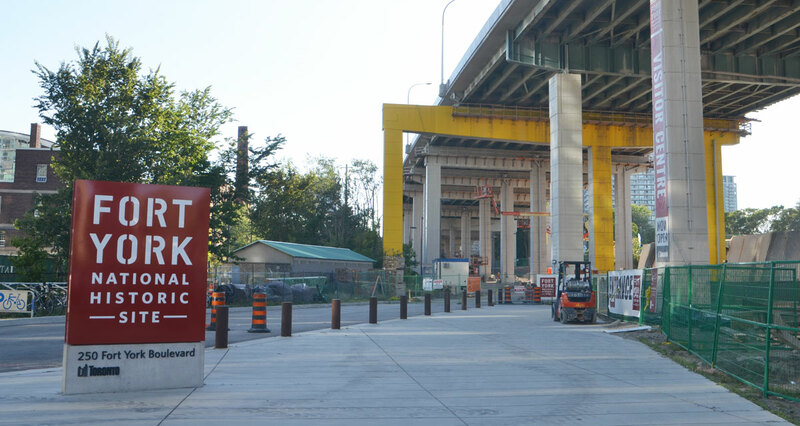 below: One obstacle is the fact that Fort York Blvd passes under the Gardiner on a diagonal. Plans are to build a pedestrian/cycle bridge over the street. Also in the photo, note the TTC bus – Fort York and vicinity are finally on a bus route. Route 121 runs between the Portlands and Fort York via Union Station. 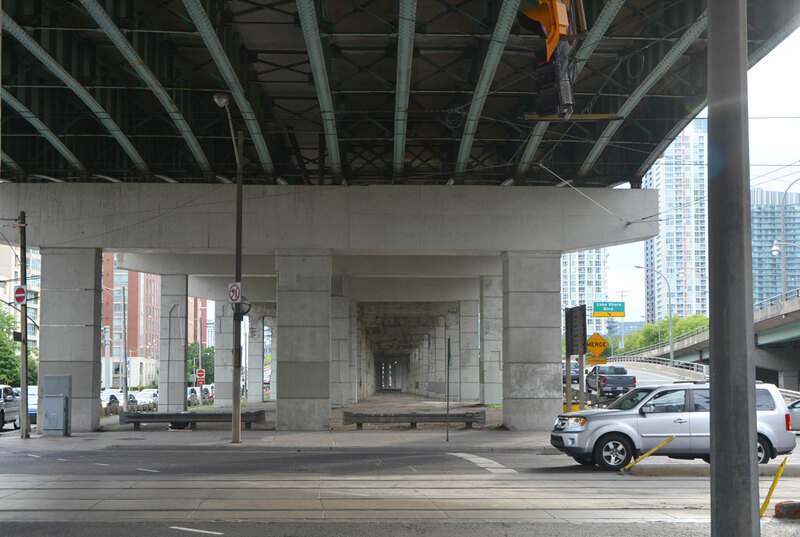 below: The section under the Gardiner Expressway between Bathurst Street and Fort York Blvd is not city owned. 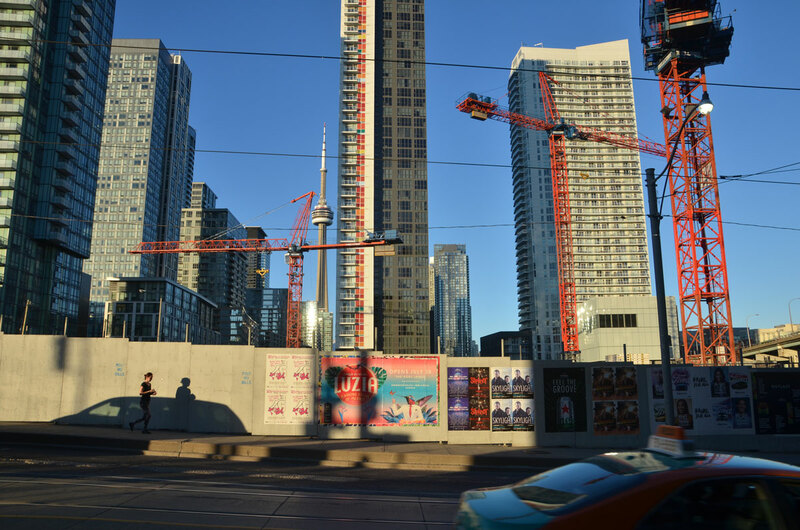 It is owned, and has already been developed, by the Onni Group who built the Garrison at Fort York condominiums on either side of it. This is the eastern end of phase 1.
below: Northbound traffic on Bathurst passes under the Gardiner. Phase 2 of the park’s development involves land between Bathurst and Spadina. This is an area that is undergoing a lot of changes at the moment, i.e. a lot of construction. 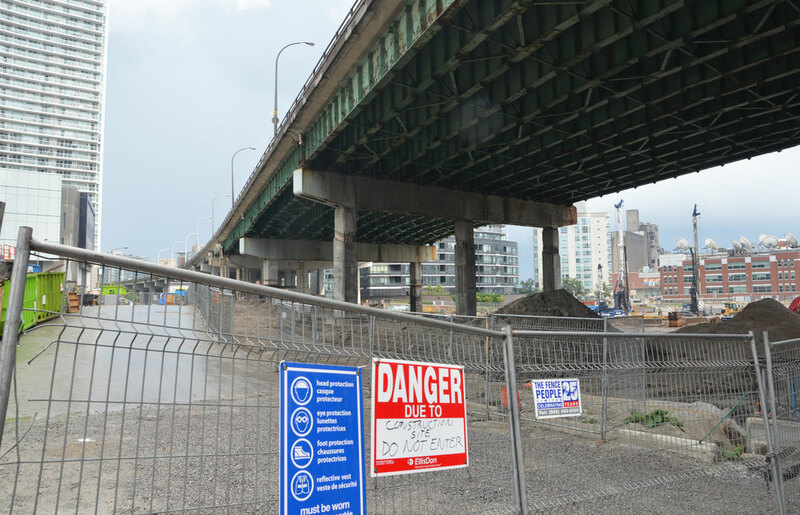 below: Immediately south of the Gardiner on the northeast corner of Bathurst and Lakeshore is a construction site. Demolition of the old 1928 Loblaws warehouse building is now complete. The facade of the old building was disassembled rather than demolished; after cleaning and refurbishing of the bricks, it will be rebuilt in its original location. 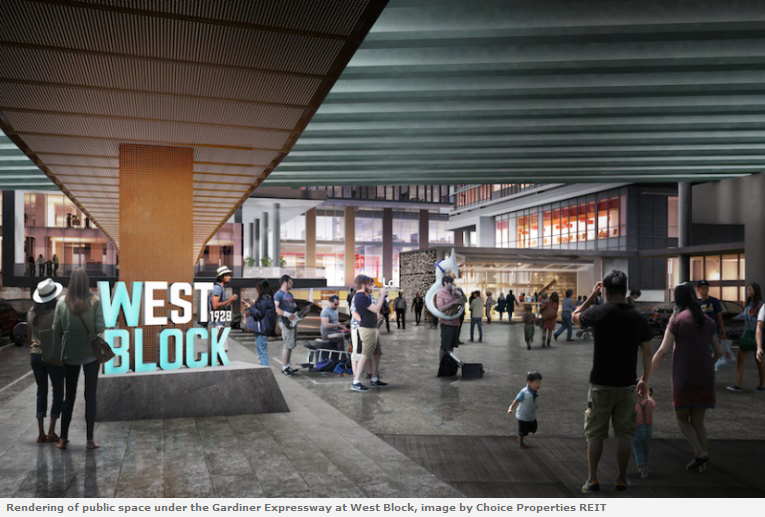 Two condo towers are planned for the space between Loblaws and the Gardiner. Yes, more condo towers to face the Gardiner and add to the tunnel effect that you get when you drive on the expressway. below: The development of this site is a collaboration between a number of developers. I found a photo of one rendition (source) of what the space under the Gardiner will look like here in the future. Public space including a cafe are part of the plans. Check back in a couple of years to see what really happens here! below: Standing on Bathurst Street, looking east along what will be Housey Street. This is just north of where the Loblaws development (above) will be. As you can see, you can’t walk there yet. below: Southeast corner of Bathurst and Fort York Blvd. This is the section of land just north of Housey Street. Construction hoardings and cranes – familiar sights in this area. It also means that taking photos of under the Gardiner here are difficult! below: Development north of the Gardiner between Bathurst and Dan Leckie Way. 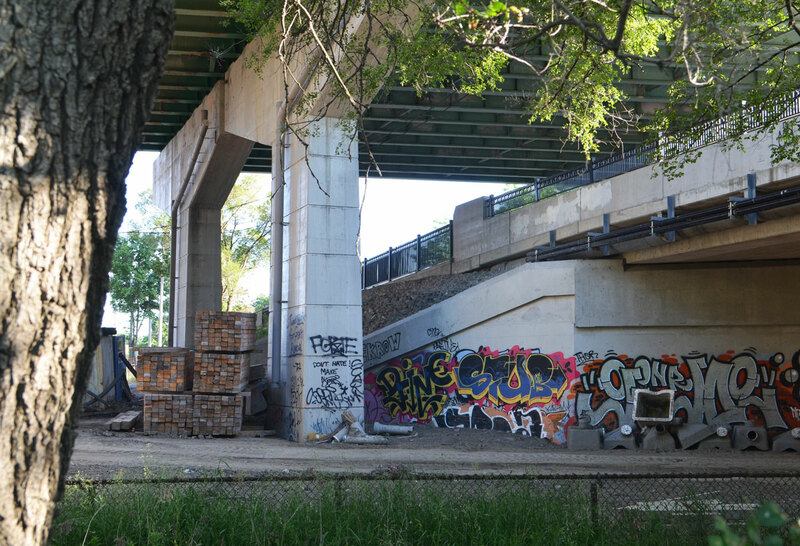 Dan Leckie Way is a north-south road that runs under the Gardiner just east of Bathurst. It is the western boundary of Canoe Landing Park. This park is north of the Gardiner and the Lakeshore. 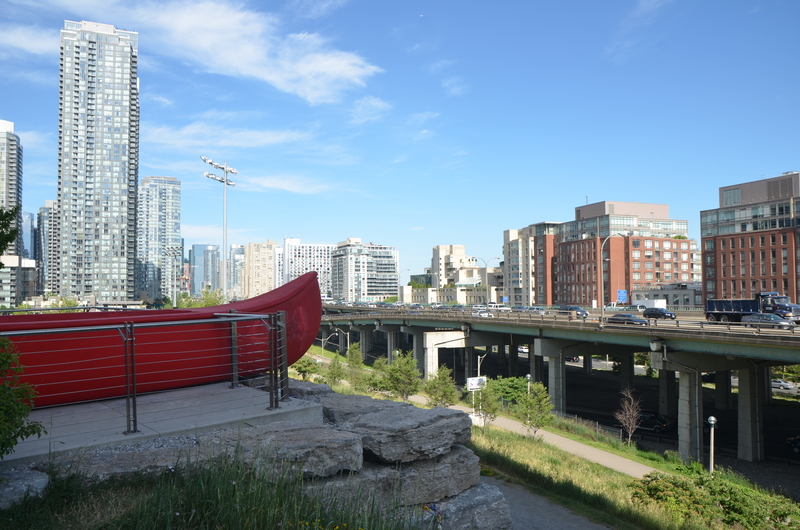 below: ‘Tom Thomson’s Canoe’, by Douglas Coupland sits at the highest point of land in the area; it’s almost at the same level as the Gardiner and is very visible as you drive by. This park extends down the hill. below: Looking the other way from the same vantage point. The street running under the Gardiner here is Dan Leckie Way . Up until this point the Lakeshore is south of the Gardiner. At Dan Leckie Way, the Lakeshore is still south of the Gardiner and the space under the expressway is wide open. 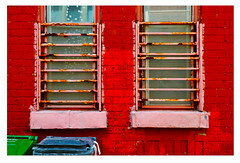 By Spadina, one major block east, the situation changes. The Lakeshore splits and westbound traffic lanes go north of the Gardiner and eastbound lanes stay south. 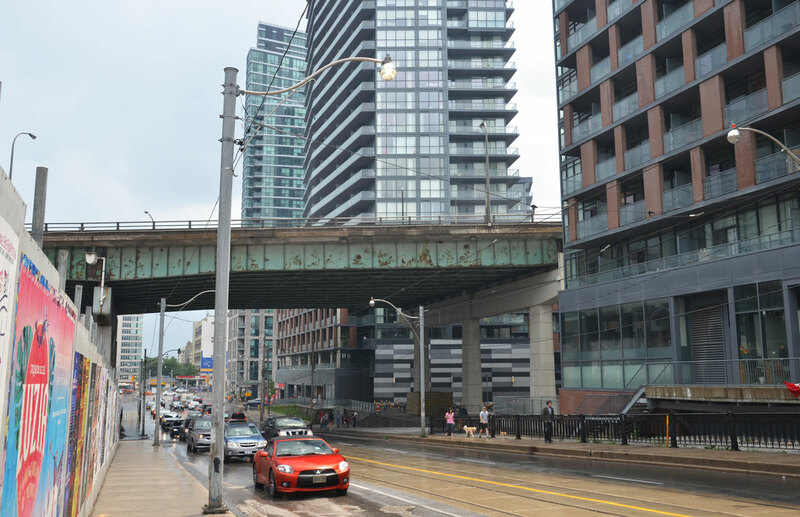 Shortly after Spadina, the Lakeshore runs under the Gardiner and there is no room for any further development under the road. below: Standing on Spadina, just south of the Gardiner and looking west. Here there is a lot of road to cross for pedestrians on Spadina. Not only has the Lakeshore split to run on either side of the Gardiner, but there are also ramps between the Gardiner and the Lakeshore. below: Still on Spadina, and still looking west, but now under the Gardiner. The space under the road is not as high as it was previously. Its lower and darker and not as inviting. It will be interesting to see what phase 2 of the Bentway development will look like in this space. I am not sure when it will to be finished but I will keep an eye on it! As for the eastern Gardiner, what does that look like? 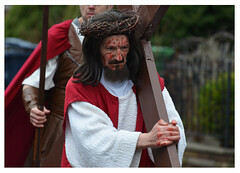 Well, that’s a whole other blog post! Project: Under Gardiner On this site you’ll find detailed maps and diagrams of this area as well as information about the plans for the various sections of the space.